GVR Lanka is a BOI approved Real Estate and Property Development Company founded by two Sri Lankan born, US based entrepreneurs, Mohan Chandramohan and Mahasen Samaravijaya (Chairman/CEO). GVR Lanka has brought together a multinational team of experts and the ensemble has worked tirelessly to create an Oasis of Tranquility with the perfect blend of luxury, nature, heritage and lifestyle. Inspired by the rich cultural heritage of Kandy, the building also has elements of traditional Kandyan architecture incorporated in to its design. 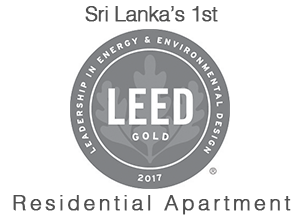 GVR Lanka is committed to protecting the environment and this will be the first residential apartment project designed in Sri Lanka under the US Green building Council’s LEED Rating System. Dynasty Residence is the first phase of a mixed development project with a total of two phases. Phase two will be a multi storied star class hotel, consisting of all luxury facilities. The project is the culmination of several years of comprehensive research and product development, which helped the developers identify customer expectations and how to deliver a high quality and defect free product.